This 7-item Accessory Gift Set ($55) has just about everything a wannabe snob could wish for, all encased in a fancy wood box. 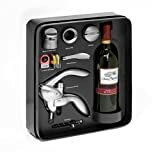 It includes a ‘patented’ one-hand cork screw, thermometer, stainless steel stopper, foil cutter, wine ring, pourer, and bottle cap. Good for someone who often entertains wine drinkers and has one of those wine bar thingys in the home. ($40) set’s centerpiece item is the Houdini corkscrew, which is a variation on the Leverpull and Rabbit cork removers. It also has a foilcutter, drip-stop ring, wine sealer, identification tags, metal whacker, and extra spiral screw. All nice pieces for the wine geek in your life. Do you know someone who keeps a “wine book” ? In other words, they keep notes on nearly every wine they drink, and glue a label next to their notes to help remember the wine? Well, it can be gosh-darn difficult to get the labels off of the bottles — especially if they use a specific type of glue that seems stronger than cement. No amount of soaking, blow-drying, or peeling can take those things off. Enter the Wine Label Savers. All you do is stick the thing onto the label and peel it right off. It works every time. They work great, but they’re not cheap, especially if you’re always recording your wine notes. 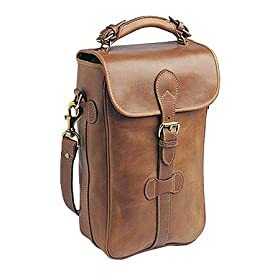 Therefore, they make a nice gift for someone who wouldn’t otherwise spend the ducats to make their life easier.